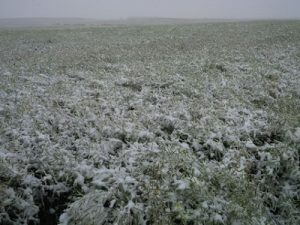 Snow on swathed canola will delay harvest, just like a rain would. In mid-October, when it can be assumed that a return to more seasonal temperatures will occur, waiting it out may be the best option. 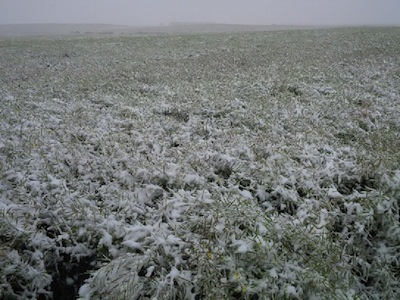 In most cases, snow on swathed canola will take longer to shake off and dry out than snow on standing canola. 1. Canola is immature when snow falls. If frost is light and the forecast shows a return to warmer seasonal temperatures, you may be better off leaving the crop standing so it can mature longer. Cutting too early (before 60% seed colour change on the main stem and before all seeds on side branches are firm to roll) guarantees a yield loss. Canola can usually withstand a light frost, but keep an eye on it for a few days to make sure pods and pedicels remain sound. Frost (whether snowing or not) locks in green permanently, but snow does not necessarily mean temperatures were low enough to create this permanent green. Rain can turn to snow at temperatures right around 0°C, and canola can usually tolerate temperatures of 0°C or -1°C without any ill effects. Also remember that moisture often reduces frost damage, and snow counts as moisture. 2. Canola is ready to swath when snow falls. This crop is mature, so frost at this stage will not hurt yield. Heavier frost will however stop the green-clearing enzymes, and green may be locked in permanently. This can’t be helped, but because the crop is mature, most seeds will be at a moisture content below where this is a significant risk. Start swathing as soon as you can. Moisture from falling snow would be just like a light rain, which can keep mature pods from shattering while swathing. If snow is heavy but warm conditions will follow soon, it may be wise to delay the swathing until conditions warm up. Otherwise snow trapped in the swath may take longer to melt away than it would if you left it standing through the snowfall period. 4. Canola in the swath was already dry and has been hit with snow. This can be treated similar to a rain event. With warm and dry days, that swath will dry down and can be combined as usual. The concern for many is whether a return to seasonal weather will occur, or if winter is here to stay. We have to assume that in mid-October, there is good weather still to come. Attempting to pick up a swath with snow on it comes with challenges. First of all, with cooler temperatures, a plan for drying must be in place as the air won’t have the capacity to dry with natural air drying (NAD). The combine operation itself may not even be possible. 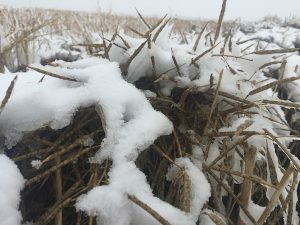 If temperatures aren’t cold enough, the snow trapped in the swath will melt as it heats up inside the combine, creating issues like iced up sieves and a gunky mess in the grain tank. The goal for combining with snow is to have the majority of the snow blow out the back of the machine, which means temperatures need to be sufficiently cold.